Many leaders in organisations know that engagement is a challenge in their organisation, but finding the answer to solving engagement issues is often a struggle. This article provides some specific elements and practices that will positively contribute to higher engagement levels. Companies need to expand their thinking about what “engagement” means today, giving managers and leaders specific practices they can adopt, and holding line leaders accountable. Here we suggest 5 elements and 20 specific practices. Companies need tools and methods that measure and capture employee feedback and sentiment on a real-time, local basis so they can continuously adjust management practices and the work environment at a local level. These tools include employee feedback systems as well as data analytics systems that help identify and predict factors that create low engagement and retention problems. After a two year research study involving discussions with hundreds of clients, Deloitte have “uncovered five major elements (and 20 underlying strategies) that work together to make organizations “irresistible.” These 20 factors fit together into a whole system of engagement in an organization, one that is held together through culture. 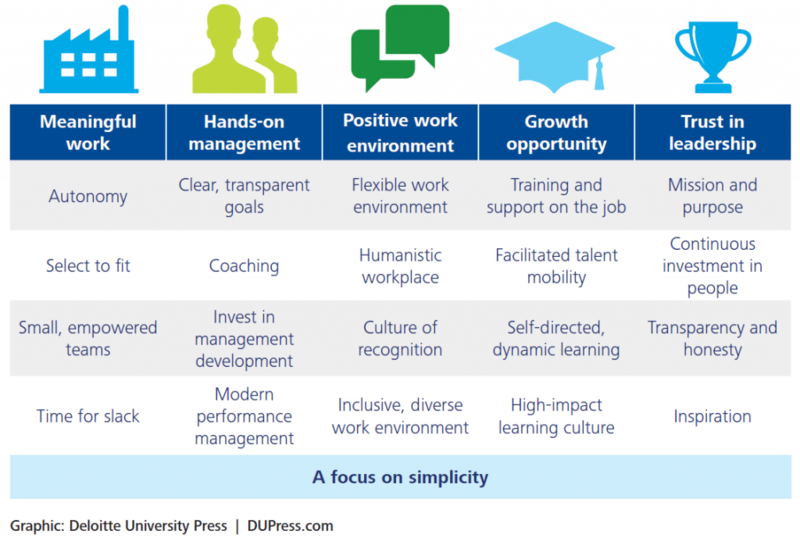 Deliberate, focused attention on each of these 5 elements, with leadership at the local level investing time and energy on these 20 strategies will help your organisation go a long way to ‘becoming irresistible’; where employees never want to leave! Print this table out. Stick it up near your desk. Or make it your screen saver? Take the time to think about each of these 5 elements, and the 4 associated strategies. How would you score your team out of 10 for each of them? Make thinking about this table the first thing you do each day. Identify one thing you can do today that will turn this ‘knowing’ into ‘doing’? (For example, when talking to your team, link the current project to the organisational purpose. Provide some positive feedback to a work mate. Find ways to do away with unnecessary processes. Reward people for investing in their own learning and development. Ask people questions to help them with their thinking – to increase their awareness, responsibility and self belief (coaching). Focus on action! And talk about these themes with other leaders you work with. And ask the team itself. What steps can you all take to positively contribute to the environment where you work? Click here to access the detailed article. ← Make getting feedback less stressful!